Today's post is about another deep treatment conditioner that I have been trialling. I feel at this point that I somewhat of a hair mask expert and definitely qualified on what's good. 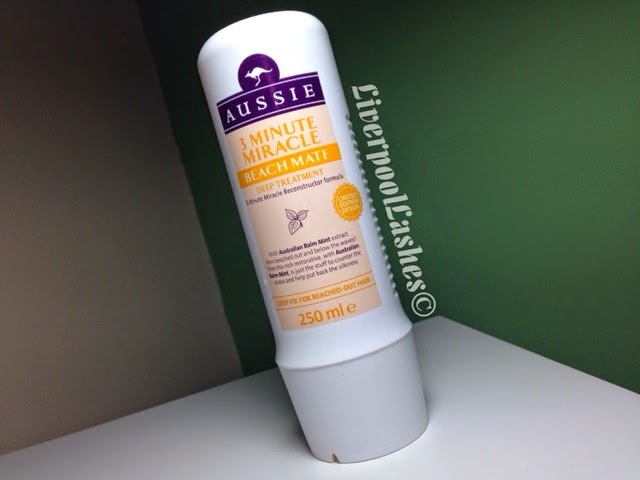 The hair product today is Aussie Beach Mate 3 Minute Miracle Deep Treatment which I bought on an introductory offer at Asda. I have tried other Aussie products in the past and I've been fairly happy with them. I love their Miracle Moist Shampoo and Conditioner as I do believe my hair felt amazing every time I used them. Let's get into it with the Aussie Beach Mate 3 Minute Miracle Deep Treatment. Firstly I love the uncomplicated packaging and the ease of use that it offers with the squeezey bottle. I really dislike the type of bottle that has some sort of screw top or a wimpy little pump, I just don't like the faff in the shower. The scent of it is really pleasant, like a vague bubblegum fragrance. I can actually smell it in my bathroom when I'm not even using, just from the bottle being in there. I apply it onto my hair and it feels the same as any other conditioner. I wouldn't say it felt any thicker or luxurious but I didn't let that put me off as I know some of them aren't like that. I probably always end up leaving it a little longer than three minutes whilst I wash, shave my legs and sing like I'm some sort of professional. Now here's the crunch, did it do anything to my hair? Sadly I believe that this 'deep treatment' is no better than a regular conditioner that I would use after shampooing. I'm really disappointed with it as the whole point of this product is aimed at beach hair to repair frazzled hair. I haven't even got frazzled hair but it didn't give me the silkiness and shine that it promised me, even though I was making it easier for it! The bottom line is... I would not recommend this product. I don't feel like it lives up to the expectations or the marketing of it that it promises it which is a shame.